Biological specimens are worthless without a record of when and where they were collected. But with that information, specimens like this Eastern Red Bat from Jones County, Ga. become time capsules. 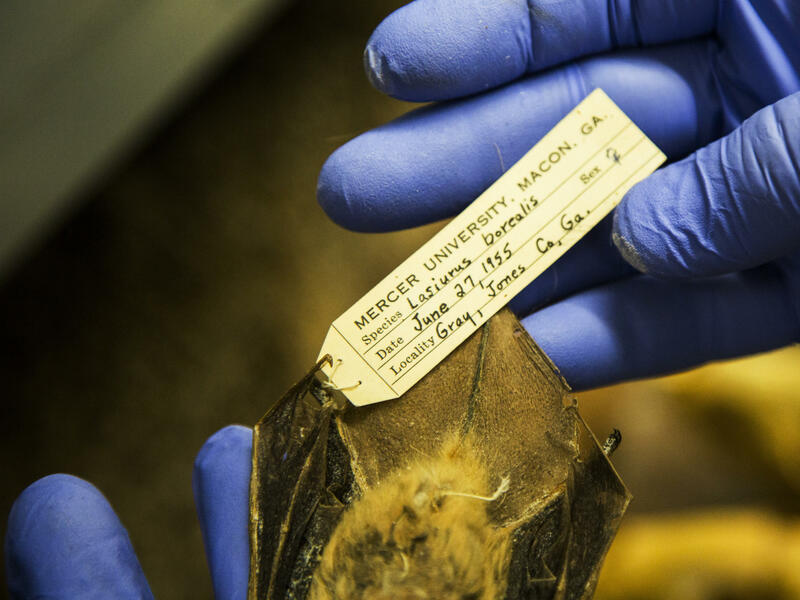 Craig Byron, a biologist at Mercer University in Macon, Ga., opens a drawer of preserved mammal specimens he found when the department was packing up to move to a new building. 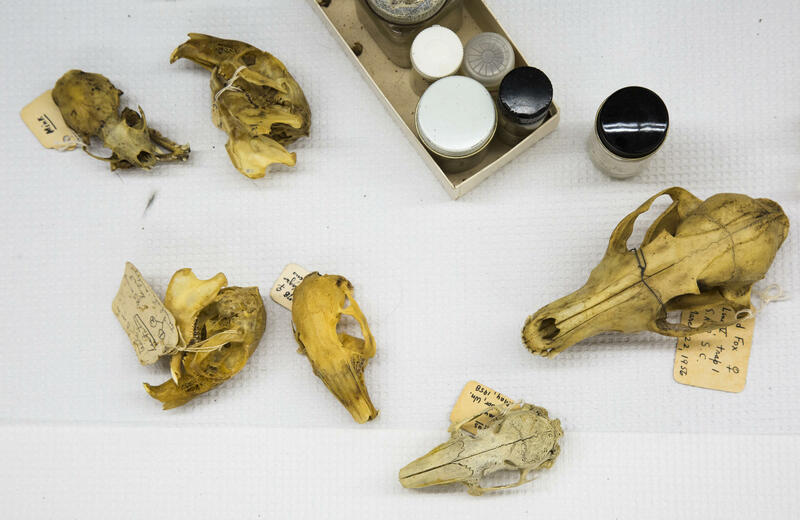 An assortment of mammalian skulls in the Mercer University collection. You find all kinds of things in drawers when you're getting ready to move. Expired credit cards. Single socks. Concert tickets. Chargers from old phones. Two-foot-long dead squirrels. Well, maybe not the squirrels - unless you're a scientist moving to a new lab. That's what happened in the Biology Department at Mercer University in Macon, Ga.
Last year, the department moved into a brand new building with state-of-the-art genetics labs, technology in the lecture halls - the works. Biologist Craig Byron was helping pack up when he came across a forgotten metal cabinet. It was big, blue, and stuffed with animal specimens, mostly collected in the 1950s. The day before the building move, Byron poked through the contents: animals trapped, killed, and preserved decades ago in the name of science. He compared two skulls in a group of skeletal remains. One, he said, was from a possum. "You can tell because it's got a tiny little brain compared to a similarly sized...probably a raccoon or something here." And then there were the animals preserved flat to fit in drawers, with their arms out Superman-style. Red foxes, bats, bobcats. Eventually Byron got to a layer of fox squirrels. One bore a tag with the date and location of its collection: Bibb County, November 20, 1958. Byron paused. "I've never seen a fox squirrel in Bibb County," he said. That's the Georgia county where Macon - and Mercer University - are located. At twice the size of gray squirrels, fox squirrels need special habitat: mature stands of longleaf pine forest. There's none of that in Bibb County today, but this squirrel told us there once was - at least on November 20, 1958. As cool as that insight was, the collection couldn't stay at Mercer. There wasn't space for it in the new building. The birds in the cabinet would go to Louisiana State University. And the mammals? "Somebody in D.C. wants them," Craig Byron said. That somebody is Suzanne Peurach at the Biological Survey Unit, part of the U.S. Geological Survey. It's the largest animal research collection in the world, 600,000 specimens total, and it's housed at the Smithsonian. Some are preserved flat like the Byron's fox squirrel. Some are stored in jars of ethanol - BIG jars, big enough to fit zebras and gorillas and pygmy hippos, according to Peurach. She curates the 300,000-plus North American specimens. Researchers ask to look at the collection for all kinds of reasons. Some want to make inferences about how the ecosystem has changed, as in the case of the Bibb County fox squirrel. Others use isotope analysis of the preserved animals to provide a window into how a species's diet changes over time with changes in their environment. Some scientists even collect the tiny creatures that lived on the preserved specimens, to help further our understanding of microbiomes. "The point of these collections is we don't know what they're going to be used for," Peurach said. She offered an example from her college days at the University of New Mexico in the 1990s. She and her mentor Terry Yates got a message to come back to the lab from their field work, as soon as possible. "People were dying from a mystery illness and they thought it might be related to mammals," Peurach remembered. This was in the Four Corners area, where Arizona, Utah, Colorado, and New Mexico meet. 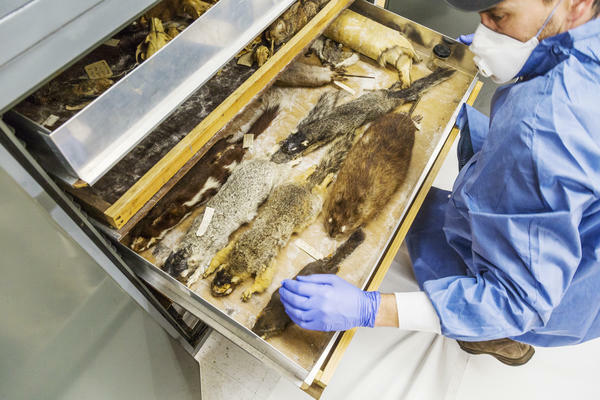 Investigators from the Centers for Disease Control came to look for clues in Yates' collection of preserved deer mice - which they knew can carry deadly hantavirus. When they looked at tissue from years and years worth of mice, researchers saw hantavirus outbreaks occurring at regular intervals. That information about the cyclical outbreaks would help scientists predict the next one. "And then all of a sudden it was like a lightning bolt hit me," said Peurach. She realized: those mice in drawers? They weren't just for arcane lab research. They could save lives. Federal budget talk heated up after we spoke with Suzanne Peurach. Some science programs were cut in the new federal spending bill, but the six-person Biological Survey Unit isn't even named in the legislation; it isn't clearly cut nor funded. So while the Unit waits for answers, Peurach is holding off on taking more specimens. That's why the animals biologist Craig Byron found at Mercer University have only moved across the street from where he found them. Today they are in the basement of the brand new science building, packed into cardboard shipping boxes and waiting on a pallet. "But they're still just kind of in limbo," Byron said. We can't know yet what questions the Mercer University bats, muskrats, and fox squirrels may be able to answer someday. For now, they're still looking for a good home. Copyright 2018 Georgia Public Broadcasting. To see more, visit Georgia Public Broadcasting. Do you remember the last time you moved? Odds are that as you packed, you found things stuffed in drawers and closets you forgot you'd ever owned. That happens when scientists move from lab to lab too. Georgia Public Broadcasting's Grant Blankenship has more. GRANT BLANKENSHIP, BYLINE: Last year, biologist Craig Byron and the rest of the Mercer University Science Department in Macon were moving into their brand-new building - state-of-the-art labs, technology in the classrooms, the works. And so while packing up the old place across the street, Byron found a forgotten big, blue, metal cabinet. He showed me what was inside. CRAIG BYRON: I mean, here's a possum skull. You can tell because it's got a tiny, little brain compared to a similarly sized - probably a raccoon or something. So this one's got a tag on it. So here's a red fox, March 22, 1956, SRPSCX. You can see some bats here. That's Aiken County, S.C. I don't know if a Lynx rufus - are there lynx out there anymore? BLANKENSHIP: All these animals were trapped, killed and preserved flat to store in drawers for science. BYRON: So here's a fox squirrel right there. So Sciurus niger from Bibb County. I've never seen a fox squirrel in Bibb County. BLANKENSHIP: That's Macon. Collection date? November 20, 1958. At twice the size of grey squirrels, fox squirrels need special habitat - mature stands of longleaf pine forest. There's none of that in Bibb County today. But this squirrel tells us there was on November 20, 1958. The birds will go to Louisiana State University. The mammals? BYRON: Somebody in D.C. wants them. BLANKENSHIP: That somebody is Suzanne Peurach at the Biological Survey Unit, part of the U.S. Geological Survey. It's the largest animal-research collection in the world, 600,000 specimens total, housed at the Smithsonian. And yes, they have things preserved in jars - big jars. Peurach curates the 300,000-plus North American species. Researchers ask to see them for all kinds of reasons. SUZANNE PEURACH: The whole point of these collections is we don't know what they're going to be used for. We save them for future research as well. BLANKENSHIP: For example, take what happened when Peurach was a college student at the University of New Mexico in the 1990s. She and her mentor, Terry Yates, got a message to come back in from fieldwork as fast as possible. PEURACH: People were dying from a mystery illness, and they thought it might be related to mammals. BLANKENSHIP: A disease was killing people in the Four Corners area. Investigators from the Centers for Disease Control came to look for clues in Yates' collection of preserved deer mice, which they knew carried deadly hantavirus. When they looked at years and years-worth of mice, researchers saw hantavirus outbreaks occurring at regular intervals. Now they had a window to the next outbreak. PEURACH: And then all of a sudden, it was like a lightning bolt hit me. BLANKENSHIP: These mice in drawers? They could save lives. Federal budget talk heated up after I spoke to Peurach. Some science programs were cut in the new federal spending bill. But the six-person Biological Survey Unit isn't even named in the legislation, either as something cut or funded. For now, Peurach can't take new specimens. BYRON: So we come in this room. Let's click on the light. BLANKENSHIP: That's why Mercer University's Craig Byron still has them, in the basement of the brand-new science building. They're on a pallet of about five cardboard boxes, packed up and ready to ship. BYRON: Yeah, but they're still just kind of in limbo. BLANKENSHIP: We don't know yet what questions the Georgia bats, muskrats and fox squirrels can answer. For now, they still need a good home. For NPR News, I'm Grant Blankenship in Macon, Ga.
(SOUNDBITE OF BROKE FOR FREE'S "FEEL GOOD (INSTRUMENTAL)") Transcript provided by NPR, Copyright NPR.